One of the loudest sections in the Siegel Center on gameday is the student section, the home of the Rowdy Rams. Photo by Erin Edgerton. Before seeing the starting lineup, court or opposing team in the Siegel Center, you’ll find students draped in black and gold, filled with energy. Rushing in an hour and a half before the tip to be the closest to the court, the Rowdy Rams are some of the most notorious student fans in college basketball. 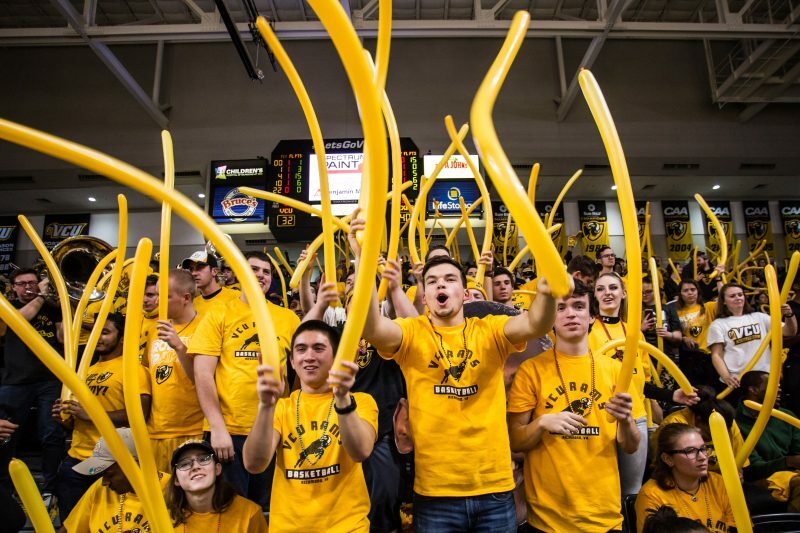 The Rowdy Rams make up the VCU Athletics student section, designed to cheer on all VCU Athletics events, but Men’s Basketball is the most popular. These “rowdy” students and VCU basketball lovers are led by a board that consists of four positions. Any full-time student can become a Rowdy Ram for $35, which gives students tickets to all home basketball games, first access to away games and benefits with local sponsors. With the deep run of the 2011 VCU Men’s Basketball team to the Final Four in the NCAA Division I Tournament, the Rowdy Rams gained fame alongside the esteemed tournament run. With any winning sports team comes a loud and boisterous fan base. The Rowdy Rams grew and were awarded the 2013 Naismith Student Section of the Year Award, beating out 157 other Division I schools. Robertson has attended VCU basketball games since 2014 and will graduate in May after five years of celebrating success and cheering on award-winning athletes. Although Rowdy Rams are most notorious for their basketball attendance, it is not all celebrating dunks and 3-pointers. As the wins come, so do the fans. Even when the Rams lost coach Shaka Smart to Texas and missed their first postseason play in seven years, the fans continued to show up. Freshman Taylor Jackowski came to VCU after one of the worst seasons for Men’s Basketball in recent years. The energy and enthusiasm of the Rowdy Rams isn’t just for the students participating — Robertson said it can affect the performance of the teams as the crowd of students chants “V-C-U, V-C-U” to motivate players. Robertson said VCU’s student section can be “alarming” to opposing teams. The Siegel Center is a special place for Rams and basketball fans alike. Basketball insider for CBS Sports Jon Rothstein credits the environment of the stadium. “A VCU home game at the Siegel Center. More life altering than a 10-day trip to Europe,” he said in a tweet. 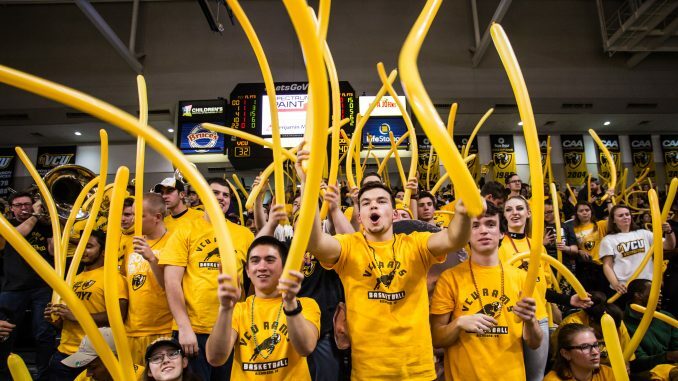 While the Rowdy Rams are not the only fans at the Siegel Center, these “rowdy” students start chants, create connections with the student athletes and make their way every game, regardless of snow or freezing conditions.